Rooms from $61.19 per night. 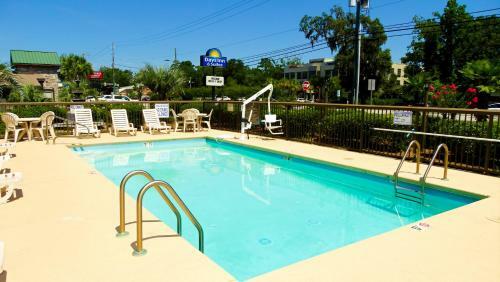 Free breakfast a business center and an outdoor pool and sundeck please our guests at the Days Inn and Suites Savannah Midtown. The two-story hotel has 60 rooms with satellite cable TV coffeemakers and phones with voicemail. Suites have microwaves refrigerators and wet bars and some offer jetted tubs or full kitchens. Non-smoking rooms are available. The Days Inn and Suites serves a free continental breakfast each morning which guests can enjoy with a free newspaper on weekdays. Business travelers appreciate having high-speed internet access and a business center with copy and fax services and the seasonal outdoor pool and sundeck offer relaxation after a busy day. Ample parking including space for RVs and buses is provided. The Days Inn and Suites is located four miles from downtown Savannah and within five miles of Savannah State University and Armstrong Atlantic State University. Oglethorpe Mall is a mile away and Hunter Army Airfield and the Savannah Municipal Golf Course are within two miles. It's a 15-minute drive to the Historic District City Market River Street and Forsyth Park. The hotel is a 15-mile drive from Savannah/Hilton Head International Airport. Add Days Inn & Suites By Wyndham Savannah Midtown to your free online travel itinerary.